It’s just a couple of weeks to the general elections and I am sure you are as excited as everyone else is. All this PDP, APC, UPN, SSS, DSS, Buhari, Gej talk is coming to an end, thankfully. Almost every debate has been about the elections in the past few weeks but that’s cool anyway because the person who takes up the mantle of leadership in this coming election is a very important decision that concerns all of us though you must have noticed that we at Legalnaija intentionally stayed away from openly supporting any candidate, it’s because we want you to make that choice personally. No point electing the wrong person though, we are getting too impatient for mediocrity in governance. However, as the Election Day itself comes closer, there are bits of information you should know and share with others as well, it’s about conduct during the elections and the election procedure itself. It all begins by every Nigerian who is eligible to vote locating his/her Polling Unit. Such person then goes to the Polling Unit to register and have their details taken down. Usually his/her picture is taken and his/her details captured. Such citizen would thus be given a PVC, I hope you have gotten your PVC’s by now? If you have not, what are you waiting for? Kindly proceed to your local government office to get them. In order to vote, one must be a Nigerian citizen; 18 years and above; registered in the constituency where he/she intends to vote and possesses a registration card obtained during voters registration exercise. Persons who cannot vote include: all persons below the age of 18 years; all non-Nigerians; all persons who did not register as voters; all persons who do not hold a voter registration card and all persons whose names are not in the voters register. Voting will be taken place at polling stations/units and all voters are expected to cast their votes at the polling unit where his/her name is on the voter register. A voter is expected to identify his polling station where his name is on the voter register. 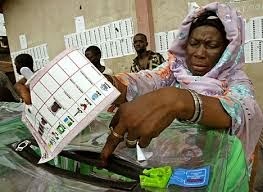 The polling unit is usually nearest to the residence of the voter. On Election day polling units will be open from 8 am for accreditation which will close at 12 while voting will start at 12:30 pm. The Presiding Officer (PO) shall: explain the voting procedure to the voters; invite all voters accredited to form a single queue; where culture does not allow men and women to mingle in a queue, separate queues are created for men and women. 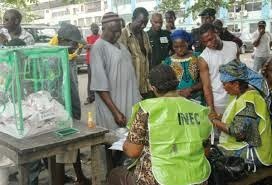 The PO shall then count loudly the number of accredited voters in the queue, and record the number. On Election Day, it is important that you go to the Polling Unit you were registered with your voter registration card and join the queue for accreditation. Present your Voter registration card to the INEC official and ensure that your name is on the register. Your finger would then be marked with ink to show that you have been accredited. At the commencement of voting, the PO shall invite the voters on queue to approach the poll clerk (PC) in an orderly manner and upon presentation of voter’s card, the PC shall check appropriate cuticle thumbnail of voter and when he is satisfied that the person has been duly accredited; Tick the voters register on the right hand side of voter’s name, indicating that he has voted; apply indelible ink on the cuticle of the voter’s appropriate thumbnail while the Poll Assistant (PA) shall apply ink to the next finger of the respective hand. For voters who have no Right/Left hand, the PA shall apply the ink to the corresponding toes of the voter’s Right/Left foot and for voters who have neither fingers nor toes, ink shall be applied on the corresponding toes of the persons assisting them. It’s important on that day that you join the queue with the intention of casting your vote. When it gets to your turn, ensure your name is ticked in the voter register after which you would be given a ballot paper listing out the political parties. At this point you would enter the booth, select your preferred candidate and place your ballot paper in the ballot box.